Some Vendors may require you prepay a portion or all of a Purchase Order. To accommodate this, you would write the check to the vendor from QuickBooks for the prepayment amount. Once you receive the bill from the vendor, you would enter in the full invoice into Acctivate and sync it to QuickBooks. Then, in QuickBooks you would apply your prepayment, which will leave an outstanding balance to be paid. Below is a detailed set of steps outlining a prepayment of a PO. The prepayment to the vendor is made in QuickBooks by writing a check to the vendor. You must set the Account to be Accounts Payable. This will create a check that can be sent to your vendor today. In this scenario we are making a 50% payment of $2,000 to the vendor. This payment will be applied against the purchase invoice later. When you receive the bill from your vendor you will enter the full amount of the bill into Acctivate. Our full bill is for $4,000. However, since we prepaid $2,000, we will only have an outstanding balance of $2,000. Entering the purchase invoice into Acctivate ensures Acctivate captures the correct costs. Once we create the purchase invoice in Acctivate you will need to run a sync so that it can be paid in QuickBooks. 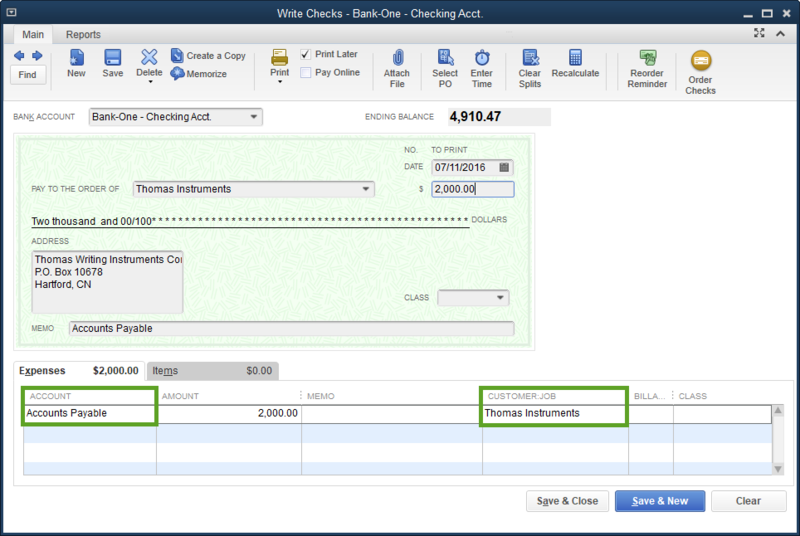 After syncing the purchase invoice to QuickBooks it can be paid. In QuickBooks, go to to Vendors> Pay Bills. When you click on the bill to pay it, QuickBooks will tell you there are available credits to apply to this bill. To view and apply the credits, click Set Credits. When you click Set Credits a new window will appear which you can select the credit and how much you want to use towards this invoice. Make your selection and click Done. That window will close and now the Pay Bills window will reflect the remaining balance. In this example, the Amt. To Pay now reflects $2,000. From here you can pay the remaining balance. The above steps will allow you to prepay your vendor for a PO. Then, when you get the purchase invoice in the future you will still be able to capture the correct cost and apply that prepayment to the vendor bill.